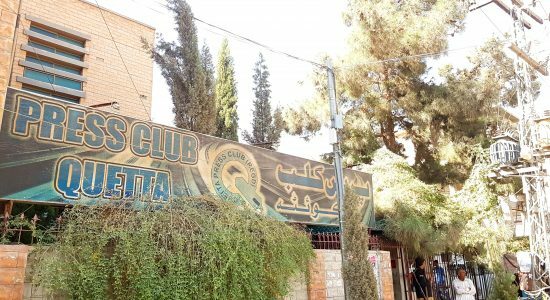 QUETTA, Pakistan: Pakistan’s troubled southwestern Balochistan province has long been a difficult place to practice journalism due to a restrictive environment for freedom of expression and a restive regional security situation. Dozens of journalists have been killed and injured over the past five years. The killers and attackers of these journalists have not been found or punished making impunity for crimes against journalists in Balochistan the direst in Pakistan. In late October 2017 things for the regional media and its practitioners took a turn for the worse. Fresh threats, coupled with greater risks now than ever before, began to translate into reality as transporters declined taking bundles of newspapers and magazines for distribution to the province’s Baloch-majority areas after banned Baloch militant groups threatened mainstream media for what they alleged was “one-sided coverage” about them and warned that anyone associated with distributing and circulation of newspapers would be a target of their ire. Transporters, hawkers and distributing companies were added to the list of ‘enemies’ that outlawed groups Balochistan Liberation Front (BLF) and United Baloch Army (UBA) said they would target after a October 24 deadline yielded no “significant results” in the shape of “favorable coverage” in the region’s newspapers. The groups warned that if the ban on sale of newspapers did not produce the desired results the next move by them would include targeting media houses and journalists in Quetta, the provincial capital of Balochistan. This warning came in printed statements issued by the groups. Caught between executive restrictions on coverage of activities and statements of banned groups on the one hand by the judiciary and the military and civilian authorities, and regular threats and attacks by the militant organizations on the other hand, the beleaguered journalists of the Pakistani province bordering Afghanistan and Iran fear for their lives. “We are faced with multiple threats. Every working journalist is vulnerable in Balochistan,” Ali Shah, the bureau chief of Dawn News channel, says as he looks through his right shoulder at CCTV monitor to glance security of his office tells Freedom Network, the Pakistani media rights watchdog. He echoes the current threat levels with a personal assessment of security situation that he and other journalists face in the wake of open threats that the two banned Baloch insurgent groups have hurled. “Journalists file stories from Balochistan at the risk of their sanity and even lives,” he adds. Caught up in this no-win situation, journalists in Balochistan have paid a steep price losing several colleagues to both state and non-state actors. Local journalists say over 40 journalists have been killed in the province over the last decade. “The latest round of threats come in the backdrop of government-enforced complete blackout of media coverage of these banned insurgent groups for the past several weeks,” Khalil Ahmed, the president of the Balochistan Union of Journalists (BUJ), tells Freedom Network. “Even a simple ‘claim report’ from banned groups taking responsibility for some violent act is now not allowed to print or to go on air,” he said. Balochistan Union of Journalists is making desperate efforts to find an amiable solution to the crisis facing the province’s journalism practitioners. “We are making contacts with representative associations of editors and media owners and seeking an urgent response to our dire situation,” he told worried members of Quetta Press Club on October 14, 2017 while addressing a protest meeting to condemn the threats and murder of a journalist in neighbouring Khyber Pakhtunkhwa province. The Balochistan government, the BUJ president rued, has not made any contact with the community to alleviate the safety and security concerns after the threats. “There has been no formal contact by the government so far,” he told the protest gathering. The militant groups set October 22, 2017 as the deadline for the province’s media to meet their demands for “greater and more empathetic” media coverage. The deadline was extended by two days after local journalists’ representatives opened communication channels with these groups’ spokespersons. This deadline also passed after there was no change in policies from the media houses and over the next several days no newspaper was distributed in the province. This prompted the first official statements from All Pakistan Newspaper Society (APNS) and Council of Pakistan Newspaper Editors (CPNE) condemning the threats and deadlines from the militant groups and demanding protection of their interests by the government. Meanwhile for the working journalists and media workers, the threats have not receded. On October 26, 2017 the office of a newspaper distribution agency was attacked in Turbat in an unveiled warning to the media and journalists that the threat remained potent. The journalist community called on both provincial and federal governments to extend them protection in the face of looming dangers to their safety and security. It is an open secret that the mainstream media in Pakistan is avoiding reporting adequately on the political and security situation in Balochistan because of pressures from the military and the federal government. The mainstream media is even not reporting Baloch political parties, which are taking in democratic process. “There are question marks over the national media’s coverage of Balochistan and this compromises safety and security of journalists in Balochistan,” senior journalist and former Quetta Press Club president Shahzada Zulfiqar asserts. The pressures faced by the media practitioners in Balochistan vary from banned groups wanting greater media coverage to state institutions, including judiciary, which want zero coverage of militants and their activities. Since 2008, the provincial government has registered 11 cases against editors and journalists for “violating” a court order banning coverage of banned militant and sectarian groups in the province. “The provincial government has still not quashed the cases despite promises,” Zulfiqar tells Freedom Network. “Better we are jailed for six months (for violating the court ban) than to be killed by one group or another,” the editors and journalists of Balochistan seems to be unanimous after little or no security has been forthcoming from the authorities who say they have to comply with court orders. Young journalist Zafarullah Achakzai experienced firsthand the perils of being caught up in this vulnerable environment. He was rudely woken up after armed paramilitary personnel raided his home in the wee hours of June 25, 2017 for his social media comments on security issues. “Even breathing in this stifling environment is difficult. The oxygen for free press is vanishing,” he says while narrating his ordeal. It took weeks of advocacy to get him freed. He still faces charges. Women in journalism in Balochistan are rare. Ms Abida Baloch is one of them. To safeguard against vulnerabilities, she is using tools and techniques she was taught at a training on physical and digital safety. “When my male colleagues are faced with such a critical situation, just imagine where women stand in terms of facing and dealing with the risks here,” she says. The Council of Pakistan Newspaper Editors (CPNE) issued on October 24 a statement in Quetta to express its “deep concerns” at the deteriorating state of press freedoms in Balochistan. “Different forces and groups’ intolerant behavior against media has become a daily affair. The newspapers are under stress and newspapers’ distribution is being hampered and journalists and media workers’ lives involve great risk,” said the editors’ forum chaired by President Zia Shahid. buzz going round is that “a list of 12 newspapers” has been handed over to the provincial government by the security establishment recommending cancellation of their licenses for allegedly “glorifying terrorists,” a reference to banned Baloch insurgent and sectarian groups and charge local media denies. There is no official confirmation or denial of this rumor. “All newspapers are under pressure,” veteran journalist Lala Siddiq Baloch, 78, says. He edits Azadi and Balochistan Express newspapers, which are on the list of allegedly “unwanted newspapers” too. “Our (government-sourced) advertisement has gone down 60 percent,” he says suggesting pressures are afoot to suffocate the organization’s primary source of revenue. Most Quetta-based newspapers heavily rely on government advertisement as private sector business hardly offers any advertisement, making editors vulnerable to government pressures aiming to influence editorial policies of these newspapers in favor of government and against the banned groups. “Balochistan is a security province. I am not expecting the government will come forward to protect the media,” the Baloch journalist having spent over 50 years in journalism says glumly. UBA spokesperson Mureed Baloch also accused media in Balochistan of being “part of the state’s policies.” “We warn print media journalists to stay away from newspaper offices and press clubs and distribution of newspapers will completely be stalled,” the spokesperson said in his Urdu-language statement obtained by RSF representative in Pakistan. He also added that people should get ready for boycotting the media in the province. “The continued (security) operations and attacks have gone from bad to worse. The international media is not allowed to go there (Balochistan) while local media is in control of the state and journalism is restricted to civil and military narratives,” the banned group’s spokesperson went on to justify threats and ban on media in the province. “When it comes to glorification of terrorism then it is an issue,” Kakar, the provincial government’s spokesperson, told Freedom Network in his fortified residence in Quetta. “The militants’ image in media is shows them as champions,” he was furious at mostly print media’s role in prominently placing these groups’ statements. The latest threats against media two banned groups hurled were in his knowledge. “We are watchful of verbal threats … and will respond. We are monitoring and closely watching the situation,” the government spokesperson said, aiming to reassure the journalist community. “Any journalist is allowed and encouraged to report any event it would like to report. There is no check and force shaping their editorial policies. They are independent in their editorial policies. They can report as long as they are objective,” Kakar spelled out his government’s media policy. Media practitioners in Balochistan say the local media requires both national and international media rights groups’ continued support to stand up against the pressures they face on a daily basis for stories they report. The more conflict rages on the more pressure will come on media, they fear and with it democracy will suffer. It is a horrible situation in Baluchistan. Regional reporting is difficult and hard job . There are mafias land grabbers drug peddlers Terrorists groups and all works under the umbrella of local political leaders , even local police support them. So in this type of situation reporters or journalists can not act as watch dogs . Tribute to you people doing your job very well indeed. Hatsoff.